Taking your dog to the Pet Sitter for the first time is like taking your child to Day Care for the first time. Here are some pet sitter tips. Do some research and try to determine which of the options available are best for your pet—remember you are going on vacation, don’t put them in jail They should have as much fun on their vacation as you are going to have on yours. Make plans before going on your own vacation so there are no surprises for you or your pet. First you should check out a few options. Do you have a facility near by which boards pets? There are a lot of these types of facilities opening all over as people are taking better care of their four legged family members. Visit the facility and find out how the dogs are cared for in the facility. Do they have 24 hour on site personnel to assure that in the case of an emergency in the middle of the night that your pet will have immediate attention. Are the dogs “socialized” with other dogs in a common area? This is not always a good situation for a shy dog or one with issues. If you have a greyhound like my Harpy being around barking dogs is frightening for her and she reacts in an --- shall we say an unfriendly manner. If your dog is not used to being in a crate they may become withdrawn by the experience of being locked up for periods of time. Some of these facilities offer a web cam so you can see how your dog is being treated and reacting to being away from home. If they have boarded their pet, find out what they experienced and see if that is something in which your pet would be comfortable. Pets all have their own personalities and quirks so what works for one may not work for others. Some Vets have boarding services offered and this may work if your pet has some health issues. A few years ago we had planned a trip to New Orleans and were going to have a friend stay at our home to watch our three greyhounds and two cats. One of the greyhounds had a wound that had to be dressed every day. So in the best interest of everyone we put that greyhound in the capable care of our Vet—everyone was happy and we all enjoyed our vacation. Over the last few years I have been babysitting for friend’s dogs when they go away. This works for us but there are several restrictions that I have. The dog MUST be cat friendly—I have cats and this is their home so I can not have a dog in the house that is going to make sport of them chasing them around. We must have an initial face –to- face meeting before any long term time is spent in my home. If our dogs are not going to get along I won’t risk the possibility of injury to my pets or the dog coming for a visit. You provide the food for the dog with enough for the entire visit. If there is going to be a long term visit I need to have extra funds in order for me to purchase additional food for your dog. The dog’s own bed, favorite toy and feeding dishes should come with the dog so they feel as “normal” as possible. Remember this is a vacation for the dog and should have as good a time as you are going to have on your vacation. 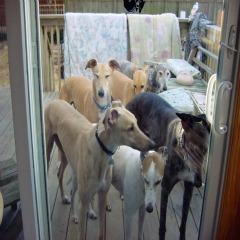 Of course for greyhounds in cold weather they need to have their own coats to keep warm when we go for walks. Also I request the name of their Vet and phone number in case of an emergency. I also need the phone number of the owner and if they have someone locally I like to have those numbers -- just in case. Luckily I have never needed to use the information. One additional request is a note giving me permission to have a Vet treat the animal if the need arise. Some Vets will require this and I like to be prepared. I also like to have a copy of the vaccinated records to make sure that there are no surprises if there are any problems with biting. You never know what is going to happen and an ounce of prevention is worth a pound of cure. The most important thing to remember is to be comfortable with the care that your pet will receive. Keep them safe because they depend on you to act in their best interest.